My part in the Changing Room exhibition ended on 6th December. 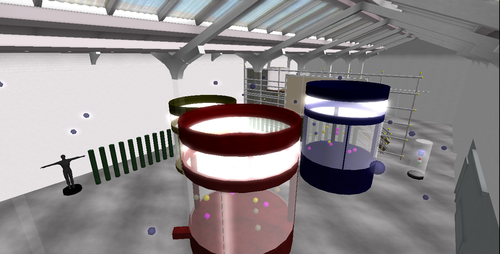 For the benefit of those wishing to build in Second Life here’s my experiences working in such an environment. I was feeling ill so didn’t do any building in world but I did discover the joys of working collaboratively using Skype. I was working in Eastside Projects as usual so decided to look around to see what inspiration I could draw from it. 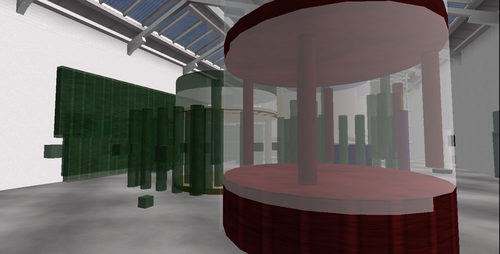 Although there’s less barriers when creating work in Second Life I wanted to create something that worked with the space or at least reflected the current show in some way. I began by documenting recurring themes throughout the current exhibition. I noticed that there were a lot of vertical lines and this could also be seen in initial work in the virtual space. Drawing inspiration from this video I wanted to see if I could take it further and create something more interactive. I had a vague idea of what I was going to build. I wanted to create pod-like changing rooms that the view would climb into and then be treated to a visual experience. I’m not that familiar with advanced functions of the building tools available in Second Life, so this was very much a day of trial and error. I discovered that maths plays a big part in plotting out shapes as there are, as far as I’m aware, no tools for snapping objects. Also, stacking objects sometimes proved difficult. One possible trick, which involved changing the object type to Physical occasionally resulted in my shapes falling through the ground! 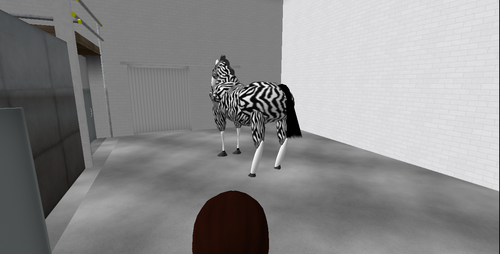 Some people had been trying to get into the exhibition but soon discovered that their avatars were too big This seems to be a problem with the way Second Life allows you to specify the size of your avatar. The Eastside Projects in-world building is (apparently) built to scale. Looking at the size and shape of some avatars it’s not hard to see why the door size could be a problem! 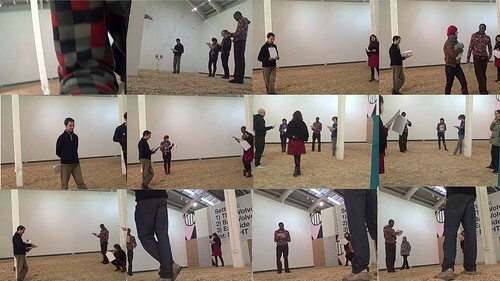 As part of trying to link the two pieces together I also went to perform in Two Short Plays by Liam Gillick at Eastside Projects. I also wanted objects to bounce around in the environment, but that would require making them Physical objects, which had already caused problems. 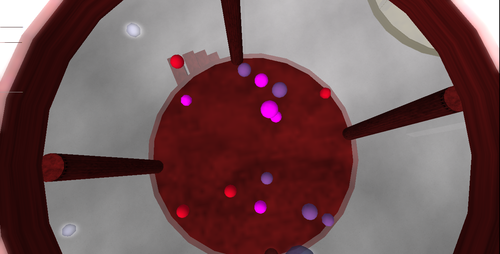 I also was finding that I had far too many unused shapes in the space and not enough time to find a use for them. The build was otherwise progressing rather well. 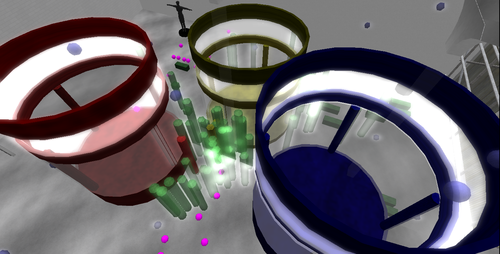 There were also difficulties in adding this video as a texture in Second Life. Within the space only Michael and Drew had the option to add media, but then I had to have access to the texture that would be used for the video. 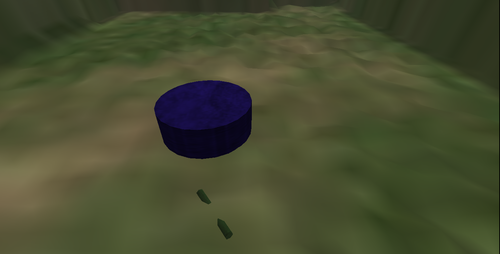 In the end I had to create a new blank texture (which required buying Linden Dollars) and then upload it. An easy fix but just not an ideal situation, especially with 20 mins before the deadline! Although my work was not completely finished I do not think that was the aim of the Changing Room exhibition. I think this is something that will evolve and I would very much like to revisit this work and add to it and explore new areas. In many ways this exhibition does mirror real life exhibitions. Although there are obvious complexities in learning how to use a computer or a new program, this is mirrored in real life when presented with any new tools with which to work with. My liaising with Michael to see what was possible to build is very similar to liaising with the gallery directors to see what is possible in the space.